In the drive to find new ways to extend electronics beyond the use of silicon, physicists are experimenting with other properties of electrons, beyond charge. 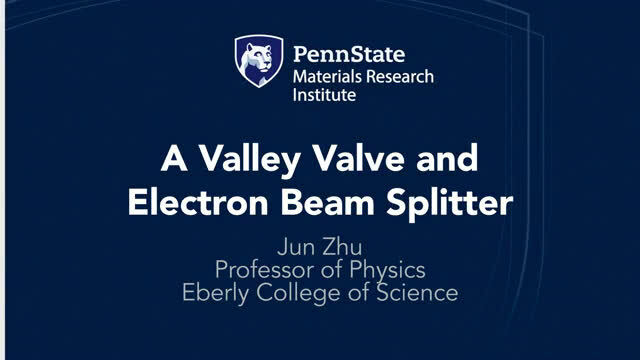 In work published today (Dec 7) in the journal Science, a team led by Penn State professor of physics Jun Zhu describes a way to manipulate electrons based on their energy in relation to momentum—called "valley degree of freedom." 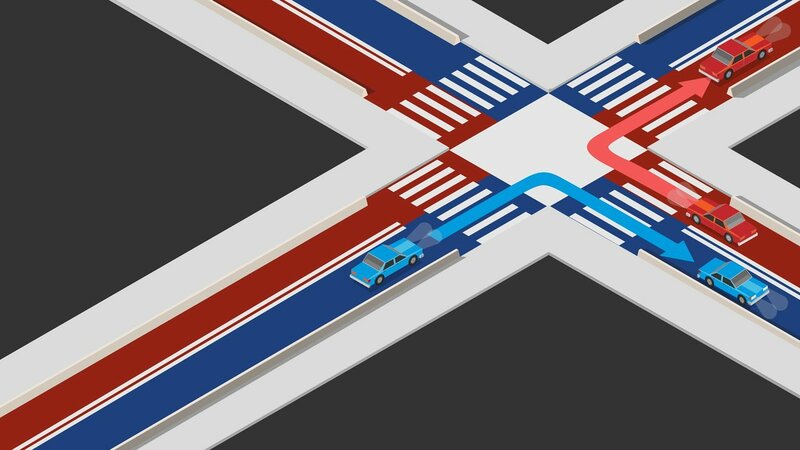 "Imagine you are in a world where electrons are colored—red or blue," Zhu said, "and the roads that electrons travel on are also colored red or blue. Electrons are only allowed to travel on roads of the same color, so that a blue electron would have to turn into a red electron to travel on the red road." Two years ago, Zhu's team showed that they could build color-coded, two-way roads in a material called bilayer graphene. Because of their color-coding, these roads are topological. 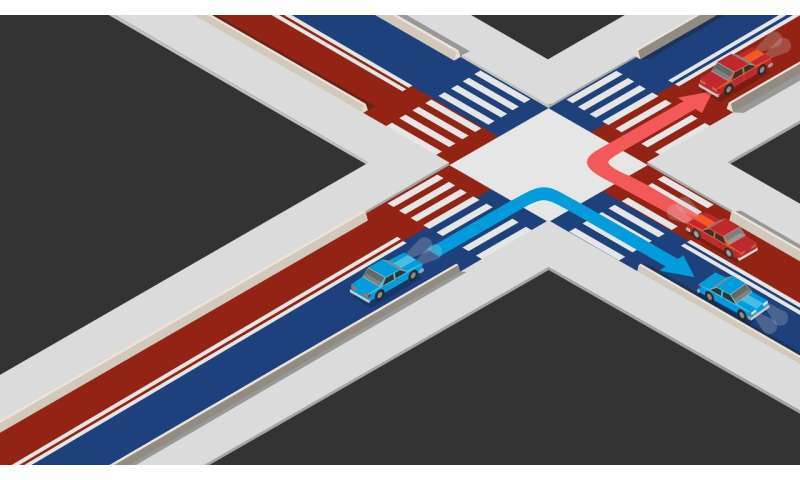 In the current study, the researchers made a four-way intersection where the color-coding of the roads is switched on the other side. Therefore, you have a situation where a blue car traveling northbound comes to this intersection and discovers that on the other side of the intersection northbound roads are colored red. If the electron cannot change color, it is forbidden from traveling onward. These roads are actually electron waveguides created by gates defined with extreme precision using state-of-the-art electron beam lithography. The colors are actually the valley index of the cars, and the color-coding of the roads is controlled by the topology of the waveguides, analogous to the left-driving and right-driving rules of different countries. Changing the color of the cars requires "inter-valley scattering," which is minimized in the experiment to enable the traffic control to work. "What we have achieved here is a topological valley valve, which uses a new mechanism to control electron flow," Zhu said. "This is part of a fledging field of electronics called valleytronics. In our experiment, controlling the topology—the valley-momentum locking of the electrons—is what made it work." "It will have to turn either left or right," said lead author Jing Li, Zhu's former doctoral student, now a director's postdoctoral fellow at Los Alamos National Lab. "We have additional ways of controlling the turning traffic—by moving the lane incrementally closer to a right or left turn, the percentage of electrons/cars turning right or left can be smoothly tuned to be 60 percent one way, 40 percent the other, or any other combination of percentages." This controlled partition is called a "beam splitter," which is common for light but not easily accomplished with electrons. Zhu and Li said they are excited about this control they have achieved for their color-coded roadways, as it enables more advanced experiments down the road. "The creation of the device requires many steps and fairly complicated e-beam lithography," Li said. "Thankfully, Penn State's state-of-the art nanofabrication facility as well as a team of professional support staff enabled us to do all this." The next challenge for Zhu's team will be to try to build their devices to operate at room temperature rather than at the very cold temperatures they currently need. It is doable, Zhu believes, but challenging. "The approach we took to make this device is scalable," Zhu said. "If large-area bilayer graphene and hexagonal boron nitride become available, we can potentially make a city of topological roads and shuttle electrons to places they need to go, all without resistance. That would be very cool."